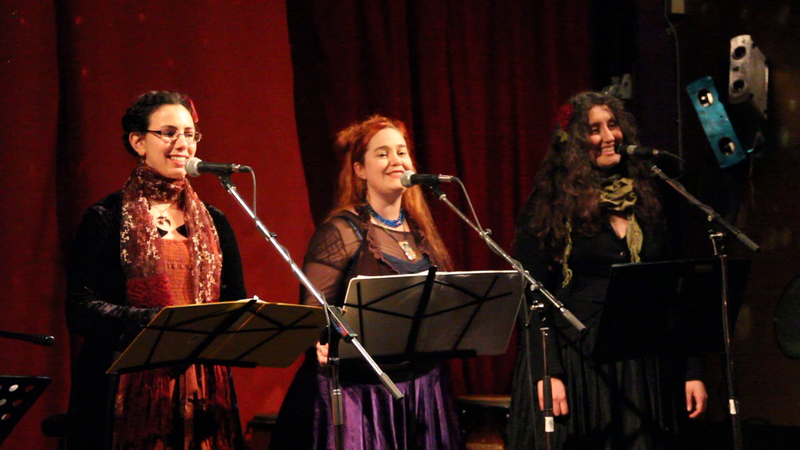 Banjo Apocalypse Crinoline Troubadours: Video! On January 12 — three days after I arrived in Canada, two days after Claire arrived in Canada, and one day after our only full rehearsal day with Caitlyn — the Banjo Apocalypse Crinoline Troubadours put on a show at the Mercury Lounge in Ottawa, playing to a full house. I’ve written about the experience of preparing for it here; Claire has done so here. But what’s exciting right now is that we’ve gone through the footage and, through the video wizardry of one Magill Foote, can share clips of the show on the shiny new Banjo Apocalypse Crinoline Troubadour Youtube channel! Caitlyn and Claire’s solo pieces (To the Royal Society of Cryptozoologists! Sea King’s Second Bride!) are still being processed, but some of mine are below, as well as our favourite ensemble pieces. It is usually a graceless thing to complain about mistakes in performance; all training cautions against it. “No one’s going to notice that” is a mantra drilled into everyone in the performance arts. Nevertheless, there are wild horses in me trying hard to kick down the barn door of decorum and shout THAT CHORD! THAT PAUSE! THAT STUMBLE! THAT UNFLIPPED NECKLACE! So I remind myself: we had one day’s rehearsal. We made up harmonies on Friday, learned them by Saturday, performed them on Sunday. Claire wrote our encore poem over breakfast. And together we made this amazing thing happen. It may not be polished or perfectly faceted, but it is warm and glowing and full of passion, and I love it completely. I frankly can’t wait to see what we do with a summer tour. And maybe TWO rehearsal days!